I have always made it very clear how much I love student shows. The young artists showcasing their work bring fresh ideas to the table that offer a glimpse into where fashion might head in the future. So it is no surprise the night LaSalle College Vancouver (LCV) students show at Vancouver Fashion Week (VFW) is a do not miss evening for me and I am never disappointed. This year is the 11th consecutive season LCV has partnered with VFW to showcase their students. Last season they decided to offer a different show featuring award winning collections created by students both local and from several of their international schools. This year they returned to featuring local talent only. What a gift for a young designer to have the opportunity to be on the runway at a large event like this. 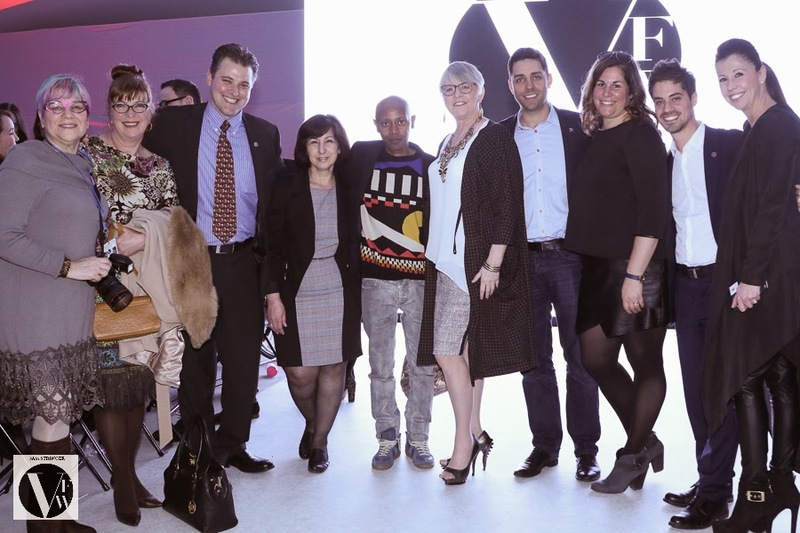 “Participating in VFW really gives LaSalle students a taste of what it is like to put on a professional fashion show.” says Diego Do Livramento, Director of LaSalle College Vancouver. These four talented artists also had the privilege of working with acclaimed Vancouver Fashion Stylist Tracey Pincott, who served as Artistic Director for their show. She brings incredible industry experience to the table as well as an energetic positive presence to every endeavor (you can read more about her HERE). The students also gained valuable experience by pairing with agency models from Lizbell to showcase their designs on the runway. Working out of the brand new LCV campus in Yaletown, the students were challenged to design an eight piece collection with a 1920’s theme in only four short months. It needed to showcase both their creativity and technical expertise. A very limited palette of white, gray and black further focused the attention on the silhouette, proportions and craftsmanship. There was no room for error. Su Yang, Shunan Zeng, Yicheng Chen and Adam-Lin Bungang all rose to the occasion. Their collections were interesting, polished and professional. Kudos to all four and to everyone involved in bringing this show to the runway. Can't wait for next season. Su Yang’s collection is inspired by the movie The Great Gatsby. She evokes 1920’s luxury interpreted in a current and fresh way. Boxy silhouettes, dropped waistlines and menswear references are given a modern twist. Shunan Zeng found his inspiration in the freedom, hope and changing role of women post World War I. Women’s clothing reflected the times, with more comfortable silhouettes and dropped waists. Shunan’s designs reflect these changes, all while creating a modern boyish look. Yicheng Chen is showing for the second time at VFW. His collection is inspired by the Roaring Twenties. This golden age of prosperity, modernity, free spiritedness and in particular, the lavish, extravagant and irreverent parties of the era, informs Yicheng’s designs. Yicheng’s collection evokes this sense of extravagance and irreverence with sparkles, feathers and low hip lines. Adam-Lin Bungang’s collection is inspired by the work of Piet Mondrian. He’s fused Mondrian’s lines with nods to 1970’s YSL, modern street chic and 1920’s silhouettes. Texture and line placement draw focus to certain areas of the body and play with proportions. The laser cut finishing and simple top stitching along the Mondrian lines create a sporty dimension, as do the neoprene and mesh fabrics.